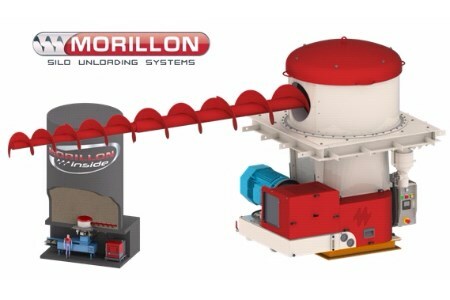 Morillon’s Hydrascrew system allows difficult-to-flow materials, whether heavy, light, powdery or damp, to be stored in flat bottom silos. The Hydrascrew system relies on hydraulic transmission, using an Archimedean screw, driven by a direct-couple hydraulic motor, to sweep the bottom of the cell through 360° and ensure discharge of the product following the First In First Out (FIFO) principle. The hydraulic transmission system allows for transmission at high low-speed torques, due to the use of the Morillon start-up booster system. The Hydrascrew also allows for full silo maintenance, the regulation of speed without the loss of efficiency and a high level of reliability. The Hydrascrew can be used in silos from 2 – 25 m in dia. And allows discharge capacities of up to 420m3/h, depending on the product. Additionally, Morillon offers the All-in-one system, which adds a hydraulic power-pack to the Hydrascrew unloader, reduces the space requirement and can be easily installed due to the Plug and Play system. The All-in-one system can be used for silos 4 – 18 m in dia. And allows discharge capcities up to 310 m3/h, depending on the product.